Saturday 6th October 2012 4pm - Performance at Southampton Art Gallery as part of the Music in the City Festival alongside the Southampton Philharmonic Choir and City of Southampton Orchestra, a wind quartet, and the Hampshire County Youth Choir. Saturday 1st December 2012 7.00pm - Christmas by Candlelight Concert. Venue: Romsey Abbey. A day of vocal training and/or Christmas craft activities will culminate in a concert in aid of Showtime for Girlguiding Hampshire West. Friday 7th December 2012 7-9pm - Hedge End Shopping carols (in the foyer of M&S/Sainsburys). 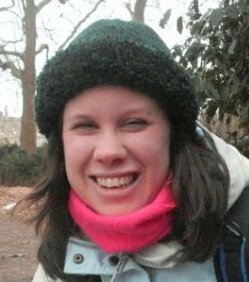 Sunday 9th December 2012 3pm - Performance at Winchester Cathedral Christmas Market (Ice skating session for those players who wish afterwards). 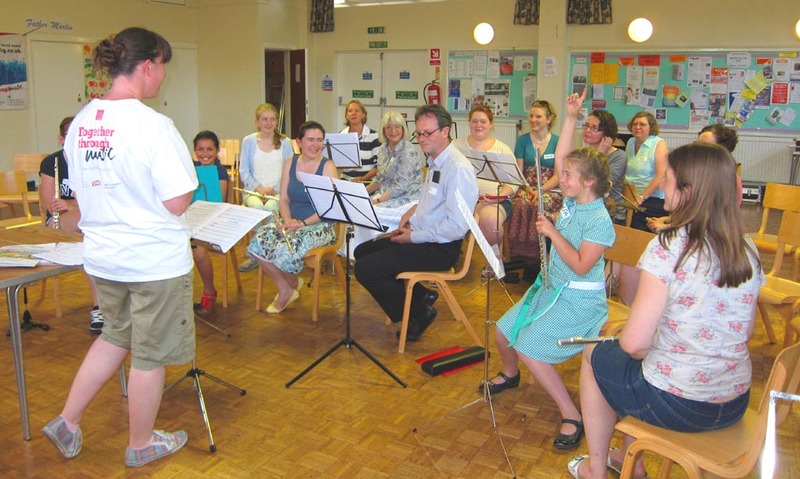 Friday 12th July 2013 6pm to 10pm - Our Big Open Rehearsal at the Church Hall (Immaculate Conception Church, Portswood) as part of national Our Big Gig 2013 event series. 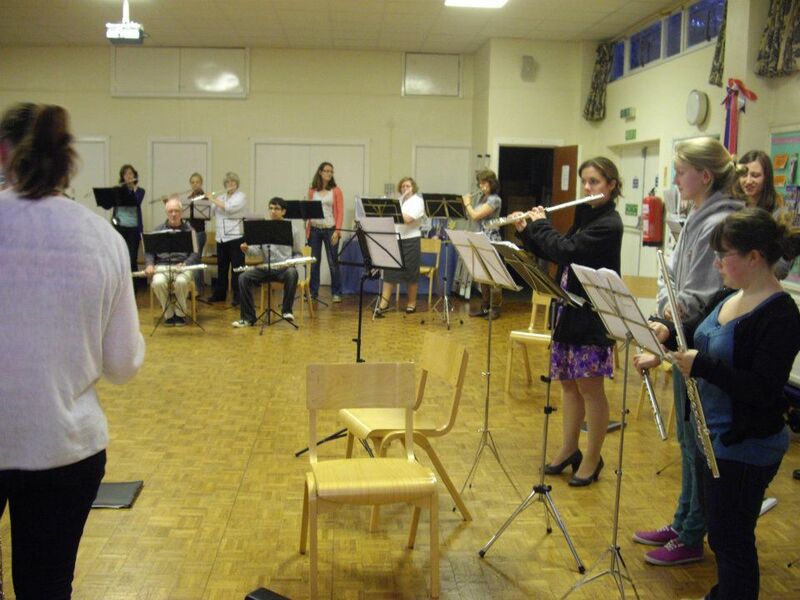 We invited flute players to come and join in with Our Big Open Rehearsal or to drop in and listen. People attending were able to watch all of the members of the flute family being played in Flautissimo, from the little baby piccolo, to the concert flute that everyone recognises, to the slightly bigger alto flute, the big bass flute, and our giant contrabass flute! Friday 13th December 2013 7-9pm - Hedge End Shopping carols in aid of the Parkinson's Working Age Support Group (between M&S and Sainsburys). Saturday 31st May 2014 - Flautissimo 30th Anniversary Reunion and Concert. Crosfield Hall, Romsey. 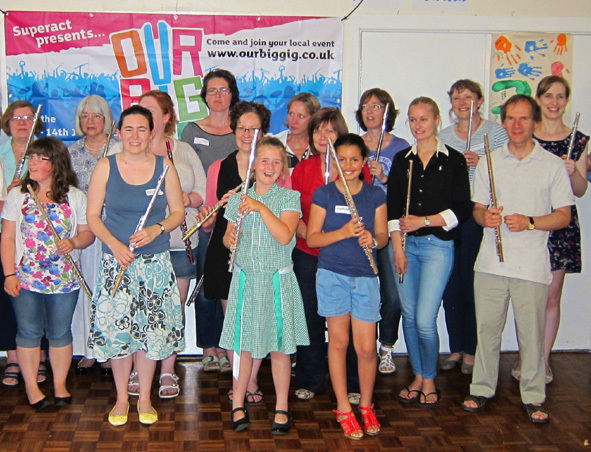 Friday 27th June 2014 - Fun Flute Variety Concert. 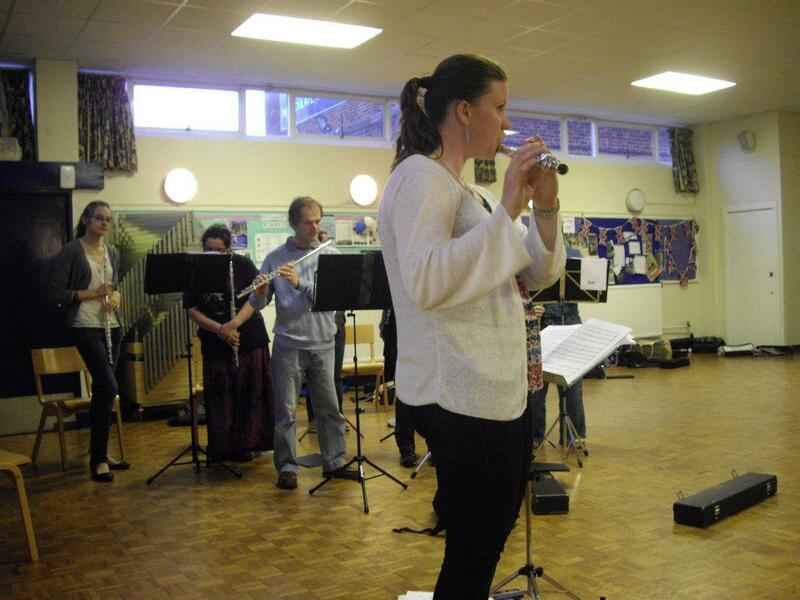 7.00pm, we encouraged all local flute players to come along, bring their flutes and join in! Church of the Immaculate Conception, Portswood, SO17 3SB. Saturday 28th June 2014 - Southampton Instrument Fayre. Cantell School, Violet Rd, Southampton, Hampshire SO16 3GJ. Saturday 11th October 2014 7:00pm - Flautissimo perform with Bishop Bells at their concert at St Peters Church in Bishops Waltham - a joint celebration as both groups were 30 years old this year! Sunday 14th December 2014 2pm-4pm - Performance at Winchester Cathedral Christmas Market. Saturday 11th October 2014 7:00pm - Flautissimo perform with Bishop Bells at their concert at St Peters Church in Bishops Waltham - a joint celebration as both groups are 30 years old this year! Tickets £7, concessions £5 and children under 12 free. Sunday 1st February 2015 3.30pm-4.30pm - Free tea-time concert given by Flautissimo at Holy Trinity Church, Trinity Green, Gosport, PO12 1HL. Collection in aid of the Handel Organ maintenance fund. Saturday 28th November 2015 pm- Flautissimo performed with Bishop Bells at their concert at St Peters Church in Bishops Waltham - 6.30pm start. Friday 11th December 2015 6.30pm - Concert recording at rehearsal, players only. Sunday 13th December 2015 12pm - 2pm Performance at Winchester Cathedral Christmas Market. 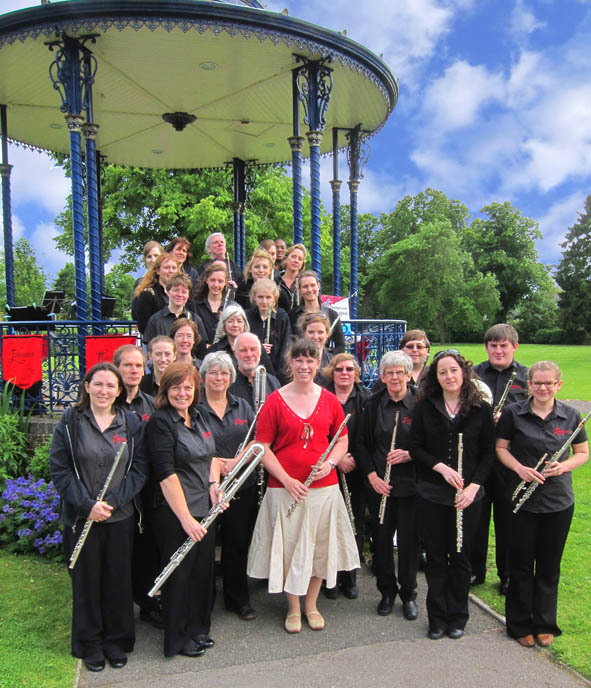 Saturday 19th March 2016 eve - Spring Concert, Flute Fiesta! Concert at 7pm with Trevor Wye, Lisa Nelsen and Flautissimo at St Paul's Church, Winchester. Lisa performed John Rutter's 'Suite Antique' with Flautissimo and Trevor performed his Carnival Show. Friday 29th April to Monday 2nd May 2016 - Flautissimo touring to Wales. Sunday 3rd June 2016 3.30pm-4.30pm approx - Free tea-time concert given by Flautissimo at Holy Trinity Church, Trinity Green, Gosport, PO12 1HL. Collection in aid of the Handel Organ maintenance fund. Saturday 10th December 2016 7.30pm- Flautissimo performed with special guests the Pop Up Guitar Ensemble at at St Martin in the Wood Church, Queens Road, Hiltingbury, Chandler's Ford SO53 5AG. Sunday 18th December 2016 10.30am - 1pm Performance at Winchester Cathedral Christmas Market. Sunday 2nd April 2017 3.30pm-4.30pm approx - Free tea-time concert given by Flautissimo at Holy Trinity Church, Trinity Green, Gosport, PO12 1HL. Collection in aid of the Handel Organ maintenance fund. Saturday 23rd September 2017 7.30pm - Flautissimo performed at the Evening Recital by Paul Edmund-Davies, Ian Clarke, Rob Buckland, Andy Scott plus special guests, at The Rose Theatre, Barton Peveril, Chestnut Avenue, Eastleigh, SO50 5ZA. Sunday 17th December 2017 (time TBC) Performance at Winchester Cathedral Christmas Market.